"This traditional Austrian hotel is filled with authentic decor reflective of the area. Complete with a small pool, large bar and enthusiastic staff it is a good value choice for visitors to Lech"
We are certain that many of our regular guests will love the Elisabeth’s comforts combined with its pretty and convenient setting in this classy, charming resort. Our team look forward to welcoming you to its well-appointed rooms and suites, excellent leisure facilities and superb location. The Elisabeth has an enviable location in the resort, tucked back from the main street and overlooking the river, yet convenient for Lech’s main facilities. A short 3-4 minutes’ easy stroll on the private road that runs by the river will take you to the heart of the resort with its attractive shops, bars and restaurants and our ski equipment partner shop. A leisurely 5 minutes’ stroll along the road running parallel to the river leads to the Rufiplatz where skiers can take the Rufikopf gondola to start their day and explore the Stubenbach slopes with its lovely open blue and red runs leading down to charming Zurs. Alternatively, take the bus from the main street, only 2-3 minutes from the hotel door, to the Schlegelkopf chair-lifts to enjoy Oberlech’s appealing runs and hospitable lunch spots with sunny panoramic terraces. For beginners the Flühen and Schwarzwand drag lifts are close to the main church and about 8 minutes’ walk, although the efficient free ski shuttle is the easiest way to get here and to the ski school meeting place. At the end of the day, ski down to the village centre from your chosen route and stroll the five minutes or so home, perhaps stopping to enjoy a warm welcome in one of the hospitable après-ski bars as you pass. The Elisabeth has been owned and lovingly cared for by the Gafgo family for many years and the pride they have taken in the hotel is clear from the moment you enter. Classic Austrian decorative features, such as warm wood panelling and beams, combine with more modern bedroom facilities and quality bathrooms to provide guests with a very comfortable stay, completed by the impressive indoor pool and leisure facilities. The attractive fireplace with feature chimney is set between the lounge bar, where tea and coffee is available, and the dining room with its smart red upholstered Stube booths and inviting decor. Free Wifi is available in all the public areas to stay in touch with loved ones and share your holiday experiences. Downstairs is the atmospheric Reindeer bar, providing a warm ambience for convivial pre-dinner apéritifs and canapés and perhaps a nightcap after your meal. A spacious, heated ski and boot room is on the ground floor with its own convenient separate entrance opening onto the quiet road which leads to the resort centre and the closest lift at Rufiplatz. We had a fantastic few days being hosted at this lovely, cosy property. The room was very spacious with a view across the river and mountains. The facilities here are really very good as well, with a swimming pool, sauna and wellness centre, and most importantly a well stocked bar open until the last guest has had enough! The food was excellent, with a choice of starters, mains and desserts all rounded off with a cheese board and lashings of wine. 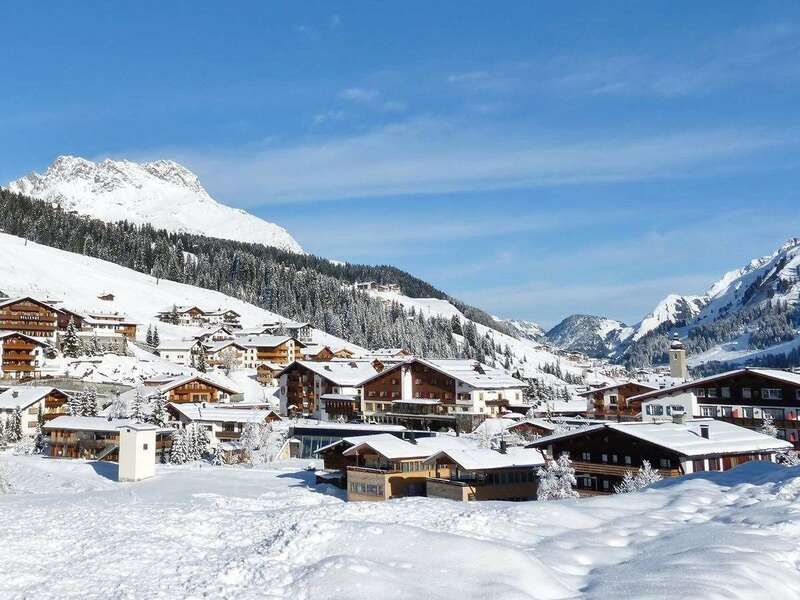 It is a very short walk down into the town and the ski lifts, and a short bus journey to the rest of the Arlberg resorts of Zurrs, St Christoph and St Anton.